Months ago, I discussed interpreting coffin birth, a phenomenon where a deceased pregnant individual appears to have ‘birthed’ a deceased newborn, actually due to the extrusion of the fetus rather than a physical birthing process. It is extremely difficult to determine, and requires careful attention to the details of the context. A new article by Sayer and Dickinson (2013) discusses a possible ‘coffin birth’ found at the Anglo-Saxon Oakington site, 5th to 8th c CE, near Cambridge, UK. By using gender theory, they argue that this evidence combined with the broader treatment of females within the cemetery can lead to interesting conclusions regarding the status of women and gender roles within this community. The burial under consideration was excavated in June 2011, and contained a woman with a fetus partially descended in the pelvis. She was aged between 25 and 30 years, was missing some teeth from birth, and had major occupational wear on her hands and feet from working. She was fully laid out on her back in the grave, wearing a full dress, with two different types of brooches. Within her pelvis, the fetus was laying low and transverse. If the baby had been alive in this position, it would have required a Caesarean section due to the dangers of it. Given that maternal mortality in this period would cause up to 50% of young females deaths, it is highly likely that this women and fetus died during childbirth. Often these types of positions within the body are attributed to coffin birth or post-natal extrusion. 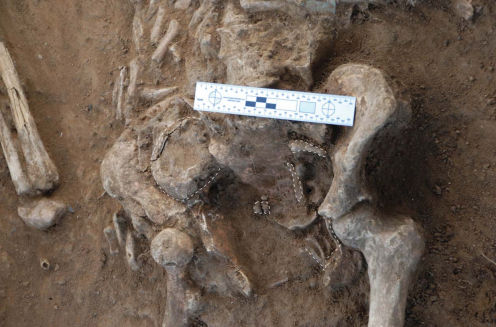 However, given the context of this burial they argue that this was not the cause of for the position of the child. The pair was not buried in a coffin but rather were placed directly into the soil. Coffin birth occurs around 2-3 days after death when gases in the body build and cause the fetus to be expelled. However, when an individual is buried directly in the ground, there isn’t room for the body is be moved and the fetus remains in the womb. Therefore, they need to determine what this burial means since it was not a cause of coffin birth. Other Anglo-Saxon female and infant double burials were examined. They found that at numerous cemeteries during this period there were burials with a women of child-bearing age with an infant within the pelvis. Some were found at the margins of the cemetery, others were found within the center, some had lots of artifacts, and others had very few or none. From this, and the fact that female mortality was high during child-bearing age, they argue that this type of death was fairly common- though it was dealt with in different ways. So why was the fetus left inside the body if it wasn’t the cause of death or part of a coffin birth? Sayer and Dickinson (2013) argue that during this period there was a system of social rules, marriage restrictions and taboos meant to control and support female fertility, inferred from historic texts. Therefore, they believe that leaving the fetus within the body or in place wasn’t an accident, it was meant to be a symbol of their power and fertility. Children are important to creating lineages, having a workforce, and aiding the future- therefore child-bearing women had a power and status to be revered. The mortuary archaeology of Anglo-Saxon England has greatly progressed over the last two decades from static analysis of type and form to a deeper understanding of symbolism and interpretation of ideology. From the deceased come more nuanced interpretations of what life was like in the past. Burials are used to interpret social status, religious change, and ethnic origin. They can also be used to understand gender and fertility. Careful attention to details aids in creating better narratives about how these individuals came to be buried and treated in specific ways. This is a well constructed argument that goes against the norm of assuming coffin birth, and posits instead that this is a symbol of female power.